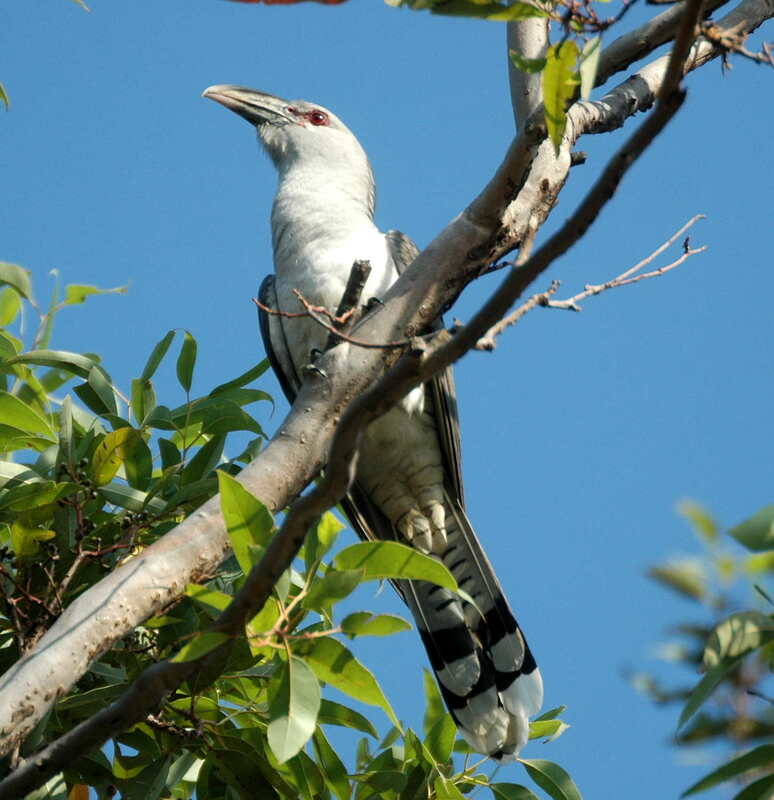 We heard the first Channel-billed Cuckoo (Scythrops novaehollandiae) of the season today – 19 September. In the eight years in which we have recorded their first calls they have occurred on September 7th (1 year), 19th (2), 20th (2), 21st (1), 22nd (1), and 24th (1). Pretty punctual for a bird that has flown all the way from its winter quarters in southern Indonesia, the Bismarck Archipelago or New Guinea. These are spectacular birds, unmistakable because of their size, large bill, and the cruciform outline in flight, not to mention their raucous calls. When they first arrive it is like greeting old friends. For a few weeks they are more or less discreet, not often heard or seen, but after a while they become more obvious, calling frequently and being chased in mad dashes in and out of the trees by other large birds which are their unwilling hosts. Eventually they engage in night-long calling sessions, well and truly wearing out their welcome, particularly as they seem to prefer to hold their meetings on ridge tops (our house being situated on a prominent one). To judge by the species which react to their presence they probably parasitise the local Pied Currawongs, Magpies and Crows. How about a quick tour for a preview of some of our different life support systems? Solar power first. There are 12 panels making up a 1.9 kW array feeding into a battery bank that lasts up to three days without sun. The building was our home for nearly ten years, and has now been lined, insulated and fitted out as a study and TV room with a guest bed. Much more comfortable than when we lived in it. The container at the back is currently a storage area, but there are plans to eventually convert it into guest accommodation. I’ve always been fascinated by the idea of using shipping containters as the basis for housing. On the righ of the photo you can make out one of our water tanks. This one is “aquaplate”, but the others are mainly stainless steel. The dish on the left is for satellite broadband internet access. Our phone line can’t handle any but the lowest data transfer speeds and certainly isn’t up to delivering modern internet content. Then there is the house, with its passive solar design. The tall windows and wide eaves on the north-facing wall allow winter sun to shine across half the width of the house at midday in mid-winter. The heat of the sun is absorbed by the concrete and is returned to the interior during the night. Lots more features of the house to talk about later, like the insulation and lighting. And the whole story of our owner-building journey. On the right you can see the first flush diverters coming down the corner of the wall. These discharge the first flow from the roof and gutters to the ground, preventing accumulated dust and dirt from entering the storage tanks. 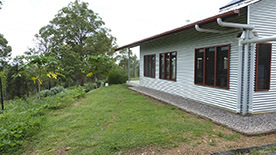 This is the smallest, lowest impact house we could build within the constraints of our space requirements, the design demands of bushfire safety considerations, and government building regulations. 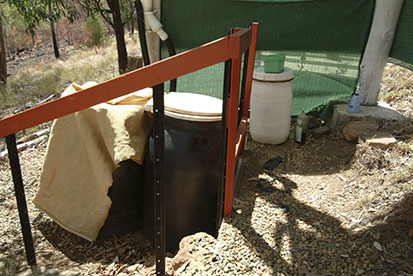 We use composting toilets, both inside and outside the house. Manure of any kind is too valuable a resource to waste. Once full, the bin is moved to the back, stocked with compost worms and left to mature until the other bin is near full. This can be up to 12 months, by which time the resting bin has produced about 150 litres of friable, rich soil ready to go into the garden beds. In this photo the bin on the left is covered with shade cloth to stop it getting too hot in the summer sun. Before we built the house we had a very productive greywater treatment system comprising a worm farm, a sand filter and a storage tank. Not only did it produce water for the garden that was clean enough to store for 3-4 days without any smells, it also produced thousands of compost worms and lots of worm castings to fertilize the garden beds. Alas, plumbing regulations do not allow such productive creativity, so now we are fully legal, and our greywater all goes to waste, literally. It is discharged under the ground in an absorption area, out of reach of our gardens and fruit trees. The loss of this greywater matters in our dry climate. 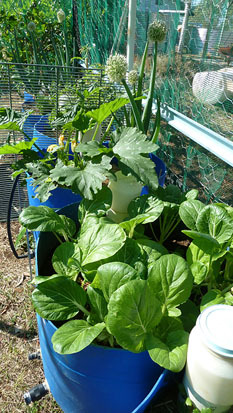 One of the solutions we are trying in order to save water is the use of wicking pots to grow vegetables. In this method water is stored in the bottom of the pot, and wicks up through the soil to the root zone. The only water that escapes is what is transpired through the leaves of the plants. Depending on the size of the plants and the weather the water needs topping up only every four to seven days. We also have small portable worm farms, producing useful quantities of worm castings and worm tea, and a worm farm that processes the discharge from our kitchen sink before it enters the greywater system. At present we are thinking about designs for a vermiponics system (worm farms connected to flood-and-drain vege grow beds). If these are successful they will become the precursor to a full-fledged aquaponics system, with native fish tanks connected to the grow beds, but that’s some way in the future. Well, that’s a quick introduction to some of our life support systems. I hope it has whetted your interest. There will be separate posts on each of these systems as time allows. Of course there are other systems that I haven’t touched on heree, including: a range of approaches to compost making, the wood-fired heating (for those few winter nights when the passive solar doesn’t quite overcome the cold), and the solar hot water. Those will be the sugject of future posts – possibly many posts, because most of our systems are in a process of ongoing development and improvement. You will find two main kinds of posts in this blog. The first will be about our journey toward a sustainable way of life on our 35 ha in the Helidon Hills. In these posts we will describe how we have tried to develop a variety of “life support” systems, ranging from mundane topics such as our waste management approaches to how we try to arrive at an ecologically sustainable way of managing the bushland for which we have assumed stewardship. The second kind of post will be about the efforts of the residents (and government) in the Lockyer Valley Region to achieve sustinable lifestyles and resource use. At this stage the life support systems in place or under development include: stand-alone PV solar power; off-mains water supply (all collected from rain on the roofs of our buildings); solar hot water; wood-fired heating; passive solar building design; greywater treatment; composting toilets (indoor and outdoor); worm farms; compost making; vegetable growing (in-ground and wicking pots); weed control; and vegetation mosaic fire management. We aren’t clear yet exactly what will feature in the posts on the efforts of others to be sustainable in the Region, but for sure it will range from the initiatives of some remarkable individuals to large-scale organic agriculture. Please, join us in this journey of discovery, and become involved in the discussion.